Yeah so the saying 'long time no see' is very much apt right now. If you guys follow me on instagram or twitter (which you totally should) you'd know that I've been bogged down with training, symposiums, differentiation and my dog has been really unwell these past two, two and a half weeks so blogging kind of took a back seat but I kind of liked taking an extended break. I've been feeling a bit uninspired of late (still kinda am) so its been nice to really pressure myself into posting for posting sake. I'm not going to promise this is me back to my twice weekly schedule but lets hope it's the start of more regular posts. Of course, I'm really open to suggestions for what you would like to see on the blog so please don't hesitate to let me know, now, onto the actual nail art! 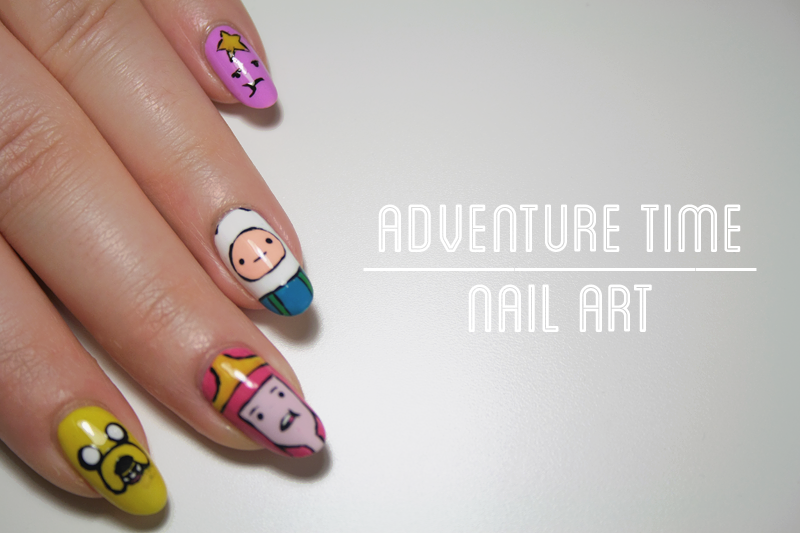 I've wanted to do Adventure Time nails for the LONGEST time, I think ever since I saw Chalkboard Nails' manicure featuring our fave characters from the Land of Ooo but this week provided the perfect excuse because Ryan's Bar is hosting an Adventure Time pub quiz tonight (30th June) so if there was ever an appropriate time for these nails, it would be now. So here's where the excuses come in. I know that it's been over two weeks since my last post and for that, I am sorry. Uni has been uber hectic lately with a big hand in date at the start of this week so I have been working away on that most of the time (even on weekends when I usually do blog stuff) but now since its handed in I hope I can blog a bit more (I still have differentiation to do so I'll be prepping for that next week) but sure, enough of my moaning, onto the nails! So the main polishes in this mani are Get Set Go* (a hot salmon pink) and Kiss Me Quick* (pastel pink) from the Speedy collection. 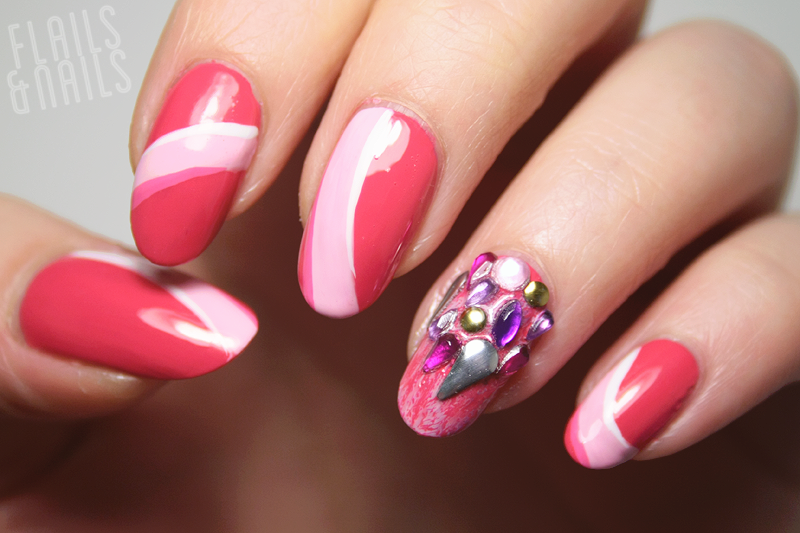 The base colour is two coats each and topped with top coat. As with all quick dry polishes, you have to be quick if you want to work with them in terms of nail art but they weren't too bad, they're great as base colours for nail art but maybe not the best for detailing. I wanted to use elements of the logo for the show and kind of replicate racing stripes but with a bit of flare, hence the curve of the design. For my accent nail, I wanted a bit of bling, which is something I don't normally do but its nice to try different things from time to time. Hopefully I'll have more from the Speedy collection over the next few weeks, as well as the rest of the new summer releases from Barry M. The Speedy polishes are £3.99 and available from Boots, Superdrug and Barry M's website. Do you watch Drag Race? Who's your favourite queen? Let me know in the comments below and be sure to follow on all the sites below, 'cos all tee no shade here hunty!